The 2014 Winter Olympics in Sochi are under way, and while you can always catch the replayed broadcast on TV, that’s not always as fun as watching the live stream. Fortunately the wonderful world of iOS apps has us covered, and for most localities you can get completely free access to live streams of the Sochi Olympics. All you need is an iPhone, iPad, or iPod touch, and then grab the app that is appropriate for your locality. For those of us in the USA, the free NBC Sports app offers easy access to live streams, full event replays, and highlights. You’ll also be able to browse schedules of the upcoming games. The quality of the live streams is excellent and should be in HD if you’re on a half-decent broadband connection. The Olympic stream works fine over cellular networks, but you’ll be eating bandwidth quickly so join a wi-fi network if you can. USA users will find there’s a little content provider catch; if you want to watch more than 30 minutes at a time, you’ll need to sign into the NBC Sports app with an approved network provider (why?). The good news is that the list of approved providers is large, including all the major cable and satellite provider networks, including Comcast / Xfinity, Time Warner, Direct TV, Dish, Verizon, COX, Charter, AT&T, Suddenlink, RCN, Optimum, CableOne, and quite a few more, so assuming you pay a monthly fee for TV you’re probably going to be good to go after you deal with the minor nuisance of logging in. 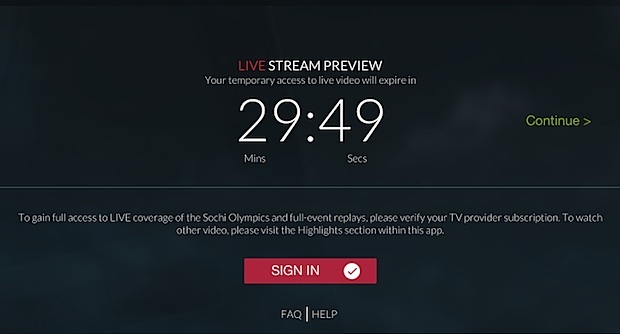 Tuners and antenna users will be out of luck and will have to deal with the 30 minute limit of the app, use an international provider to watch the live feeds, tune into a TV broadcast like some kind of neanderthal, or use a VPN service that masks their IP to another country that better prioritizes content access, such as Canada. If there is a free web-based live stream in the USA we haven’t found it yet. 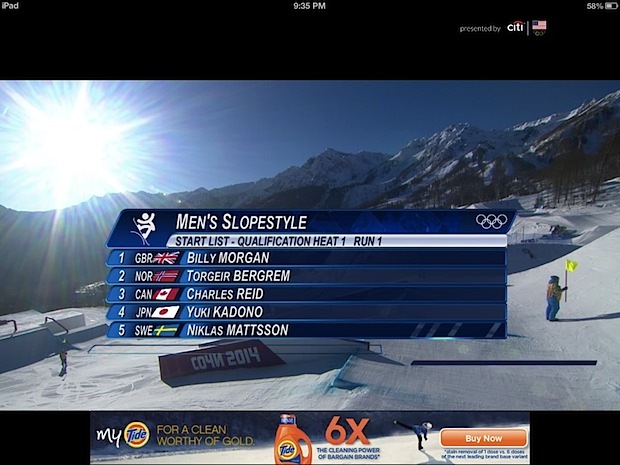 The NBC Olympics site seems to emphasize short clips and highlights rather than a universal live stream. Let us know in the comments if you find a feed in the USA that is free and high quality! Though most of our readers are in the USA, there are plenty who aren’t, and 9to5mac has pointed us to some of the international app options for our Canadians, UK, and Aussie readers, which you’ll find next. Canadians have unrestricted access to streaming feeds of all the Olympic events with the CBC iOS app, no logins required. Easy. For desktop access, the CBC website also offers free Olympic live streams to Canadians. Similar to Canada, the BBC website also offers live streams for desktop Mac and Windows users. Presumably TenPlay has a web stream for desktop users as well. 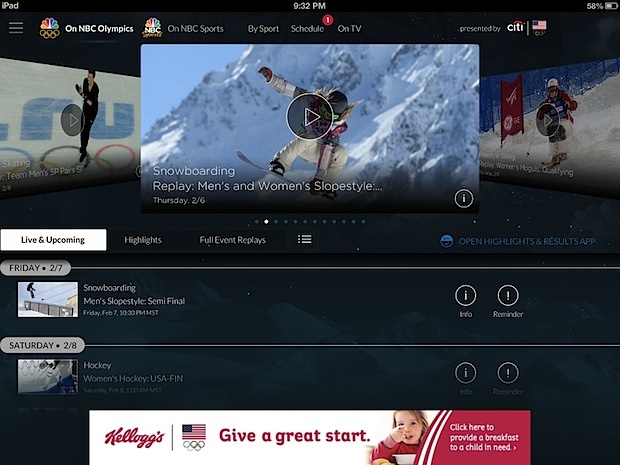 Those elsewhere in the world can try their local TV and network providers for apps, but the official Sochi 2014 live broadcast may be the best bet. This live stream is unavailable to users in the USA, but the word is that it works just about everywhere else on the globe. Enjoy the games! I found the iPad NBC stream last night, it is great but the login is annoying. Why can’t NBC detect the IP to determine who is on an eligible ISP for the stream? Feels like an oversight.